Where flooding from a free-standing beaver dam threatens human property, health or safety, a Flexible Pond Leveler™ pipe system can be an extremely effective solution. 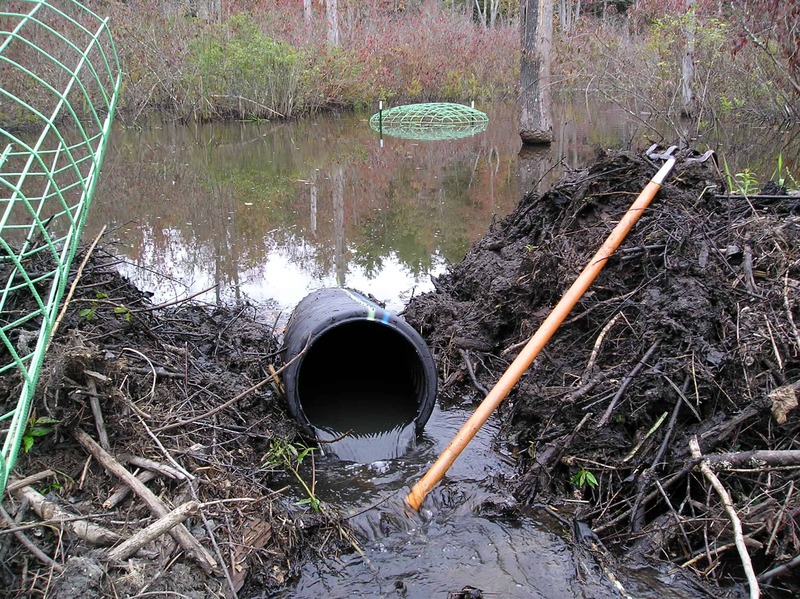 A properly designed and built Flexible Pond Leveler will create a permanent leak through the beaver dam that the beavers cannot stop. These flow management devices are so effective we guarantee them. They eliminate the need for repeated beaver removal. In order for these pipe systems to work, they must be designed so that a beaver cannot detect the flow of water into the pipe. 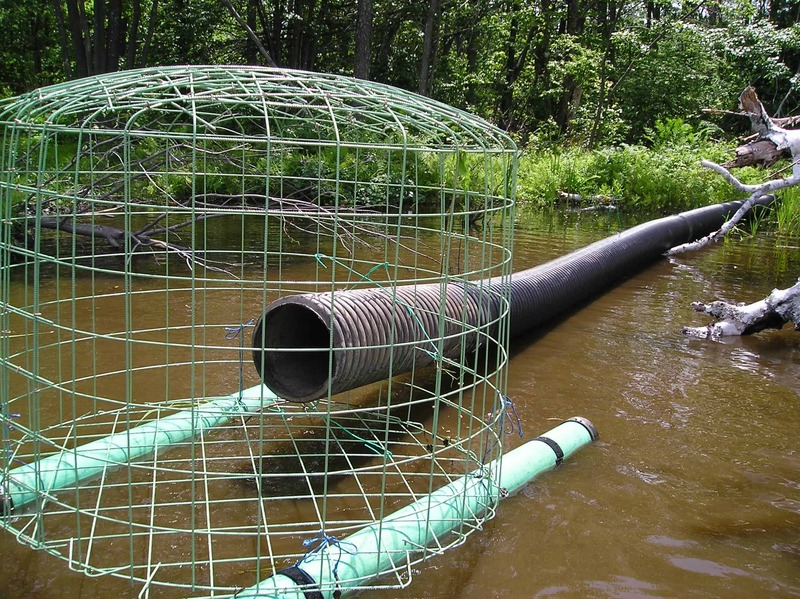 The Flexible Pond Leveler™ works by surrounding the submerged intake of the pipe with a large cylinder of fencing to prevent the beavers from getting close enough to the pipe intake to detect water movement. As a result, the beavers do not try to clog the pipe, and maintenance is rarely needed. Usually a pond depth of at least three feet is required for these beaver dam pipes to function properly. The height of the pipe in the dam determines the pond level (see diagram). Water will flow through the pipe unless the pond level drops below the peak of the pipe. 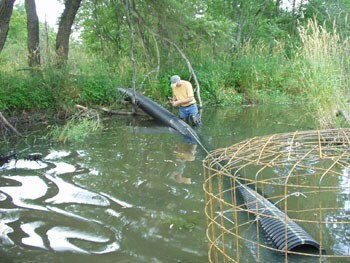 The pipe is set in the dam at the desired pond level, and can be adjusted up or down if desired. 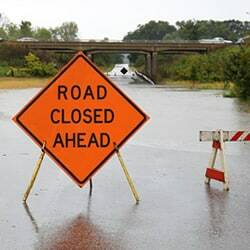 Flexible Pond Leveler™ pipes do not need to be sized like road culverts to handle catastrophic storm events because heavy storm runoff will simply flow over the top of the dam. Following the storm the pipe will return the pond to the normal level. Some mild pond fluctuations are possible following very wet periods, but since the dam height is controlled by the pipe the water remains controlled at a safe level. When installing a pipe system it is very important to lower a pond only enough to protect human interests. The more a pond is lowered the more likely it is beavers will build a new dam downstream to render the pipe ineffective. Lowering a beaver pond by up to one vertical foot is generally not a problem. A single round of beaver trapping may be necessary prior to a pipe installation if a beaver dam must be lowered by 2 feet or more. Beaver removal will prevent them from building new problematic dams in response to the lower water. Fortunately though, when new beavers relocate to this area they are likely to tolerate the smaller pond with new dam building because they do not have the memory of the higher water level. Therefore, repeat beaver removal is usually not needed. Pipe diameters vary depending upon the size of the watershed. 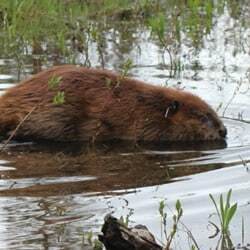 A professional Beaver Solutions Site Assessment will determine if a Flexible Pond Leveler or other beaver control device is feasible and which is your best option. If you live outside our southern New England service area we recommend you contact the Beaver Institute. Flexible Pond Levelers™ pipes are usually 10″, 12″ or 15″ diameter. All Beaver Solutions maintained devices include our “Worry-Free Guarantee”. Follow-up support is always available at no additional cost.